[Annual Bay Area anarchist bookfair, 11th] / Hugh D’Andrade. 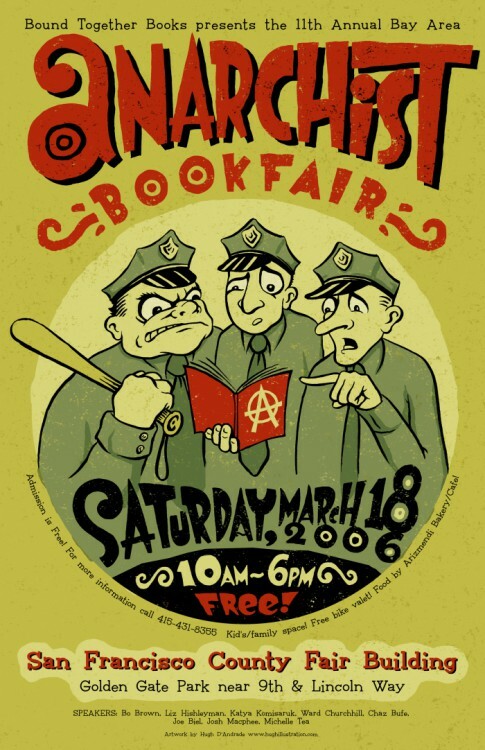 — San Francisco : Bay Area anarchist bookfair, 2006 . — 1 affiche (impr. photoméc. ), coul. (trois : rouge, noir, vert, papier blanc) ; x × y cm. Admission is free ! For more information call 415-431-8365 — Kid’s/family space ! Free bike valet ! Food by Arizmendi Bakery/Cafe ! Speakers : Bo Brown, Liz Hishleyman, Katya Komisaruk, Ward Churchill, Chaz Bufe, Joe Biel, Josh Macphee, Michelle Tea.